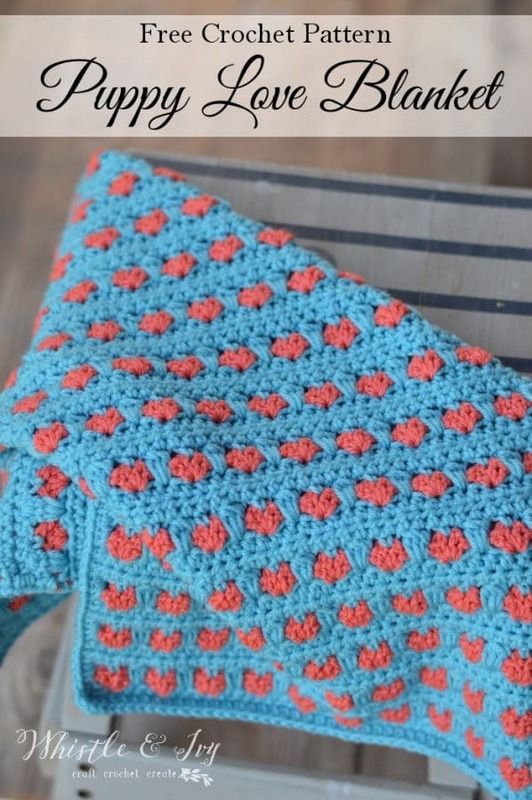 Learn to make this adorable crochet baby blanket in the cute Puppy Love Stitch! This pretty stitch resembles adorable little hearts. The look is easy to achieve and is done in simple rows. 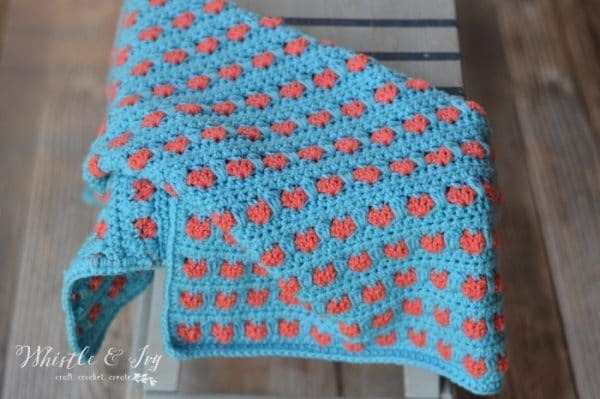 Get the free crochet pattern for this cute heart crochet baby blanket! The post contains affiliate links, which means I get a small commission if you make a purchase, at no extra cost to you. Thank you for your support! Today marks a bit of a milestone. I am a obviously a crocheter, and have been for a while, but today I FINALLY finished my first crochet blanket. Those of you who make afghans regularly, I salute you. No one but crocheters (and knitters) understand the time and work that goes into a crocheted afghan or blanket. So. Much. Time. And this Puppy Love Crochet Baby Blanket is quite small, like carseat size. Someday I will attempt to make a bed-sized afghan, but it might have to wait until my kids are in school and I have a bit more time on my hands. 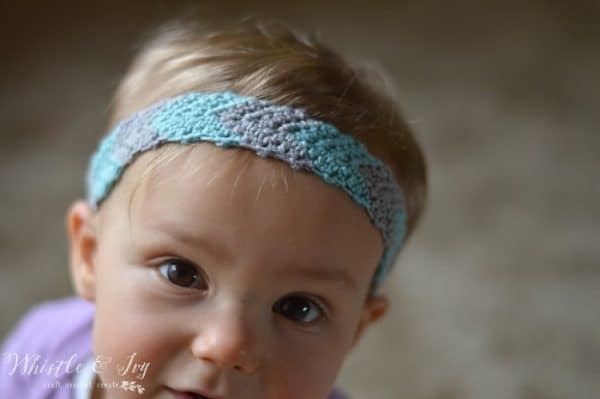 When Red Heart sent me a couple skeins of their new line of baby yarn, Baby Hugs, I decided to make my popular Puppy Love Slouchy Hat Pattern >>(toddler version can be found here)<< into a blanket pattern. This blanket is different than the hat in that the hearts are not off-center. 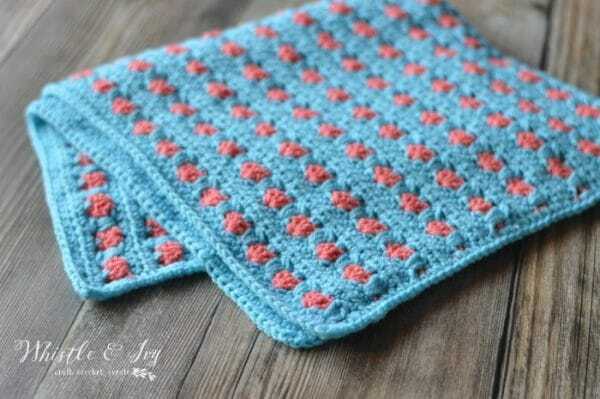 The blanket pattern repeats 4 rows continuously, so it would be very easy to size up! Be sure to work in multiples of 5 +2 for the foundation chain if you decide to make a larger size. Special Stitch: 3-dc cluster: Yarn over, insert hook. Yarn over, pull through st (3 loops on hook). Yarn over, pull through first 2 loops (2 loops remaining on hook). Yarn over, insert in same st. Yarn over, pull through. Yarn over, pull through first 2 loops (3 loops remaining on hook). Yarn over, insert into same st. Yarn over, pull through. Yarn over and pull through first 2 loops. Yarn over, pull through all 4 remaining loops. If it’s easier to understand, it’s a basically a dc3tog (or a 3 dc decrease) worked all in the same st.
2. Ch 1. Sk same st. *4 dc shell in next st. Ch 1. Sk 3 sts* work 17 times. Dc in last st. (86 sts) Turn. Join Sky color, don’t cut Peachie. 3. Ch 1. Sc in same st. Work a 3-dc-cluster in the middle skipped stitch from 1st row. *Ch 1. Sc in middle of the shell. Ch 1. Work a 3-dc-cluster in middle skipped stitch from 1st row. * work 16 times. (70 sts) Turn. Repeat rows 2 through 6 (respectively) until you reach 73 total rows. Don’t tie off. Hdc around the blanket starting where you left off from the last row. Hdc 2 more in the same st to make a corner and hdc down the side (the stitch count doesn’t matter too much, just try to space them evenly). Be sure to work 3 hdc in the bottom corners. Hdc up the other side, hiding the sets where you pulled up Peachie. When you reach the top, work only 3 hdc in last sp and hdc across the top. Tie off. This Puppy Love Baby Blanket is the perfect car seat size, so you can use it to shade baby in a car right or to lay on while playing on the grass. Want to see more? Subscribe! I’m working on this pattern and I can’t seem to get it right. For some reason my hearts aren’t on top of each other instead they appear to be over just one stitch making the blanket get bigger on one side with every new row. But when I count my stitches they are all the same! It’s driving me crazy! Only thing I changed was 92 chain instead of 72 to make it a little bigger. Any thoughts? Hm. Each row has the same count? Maybe you can send me an email with a photo. I have started this 3 times and I can’t get it to be symmetrical . 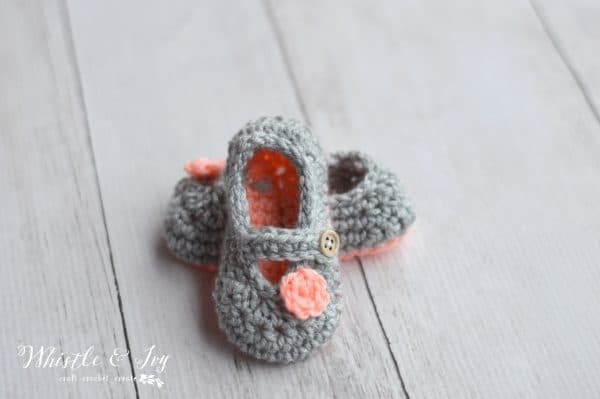 I love the pattern and have been crocheting many years, but this has me stymied. I’m going to give it one more try…tomorrow. Can you explain your trouble in a bit more detail? By symmetrical do you mean the design or the shape? The design. Are there a certain number of stitches of the “sky” before and after the shells? You start out row 2 with a sc and then a Cluster. Seems you would end row with cluster and sc If it were supposed to be symmetrical. Am I making it any clearer? With 17 shells (hearts), I would expect #9 to be in center. That is correct, I think you just don’t like the design, I am sorry! I LOVE the design. I’m just not sure I am doing it right. I will definitely make this pattern. I bought yarn to make 2 of them. Ok I have a question about row 2. I’m coming up with 70 sts not 86. I don’t know what I did wrong but the 70 is working for me. I watched the video for the puppy love stitch and noticed that you were doing a chain 2 not a chain 1. Could that be my problem? No, it’s a bit different than the hat. The only thing I can think is maybe you are skipping too many stitches? I red-did the math and it’s correct. It’s a 5 stitch sequence worked 17 times + a dc at the end which makes 86 sts. Is this a blanket that a beginner could make? Thank you! It’s not beginner level, no, but you can always give it a try and see how you do! Could you help me understand the dc cluster ? Yes I can. Do you know how to work a dc2tog? I love this its so cute. I was wondering if there was a how to video on this? If not could you please think about makeing one in the near future. If you prefer you can do that! Love the blanket ! Thank you for linking up with us at #HomeMattersParty. We would love to have you again next week. The toddler blanket link takes me to the hat pattern. 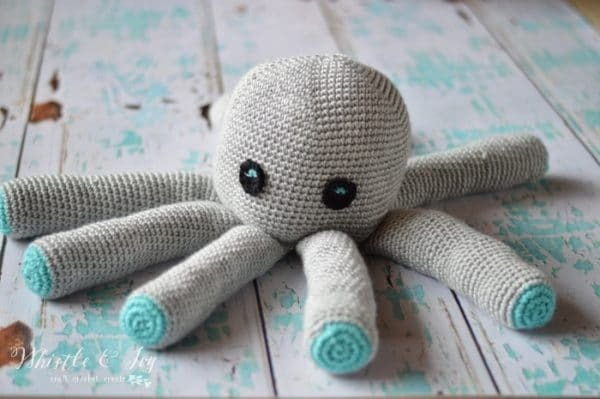 Where can I find the toddler size blanket pattern? Never mind…I just reread and realized I misunderstood. Love this blanket. thank you. Have saved it and will try it soon. Wonderful work. Im like you Bethany, Im not big on the afghans/blankets because they are veru time consuming. You did a great job!!! Ilove it!!!! Cute! Thank you for your lovely pattern.